It’s time to look at a really old murder mystery film. It’s definitely an interesting noir title, but one that is held back by some issues. The biggest of these issues is naturally the main character who is extremely annoying throughout the entire film. The guy just never knows when to man up and face the music. Still, while this one won’t be winning any film awards, I’d recommend checking it out. It does still have a pretty interesting premise. So the film starts with Vince breaking into some lady’s house and murdering someone. He then runs home and “wakes” from his dream. The problem is that Vince has quite a few pieces of physical evidence that prove he was at the house. He then gets caught in a rainstorm with his brother in law who’s a detective, the detective’s wife, and a co-worker from his job. They have to take shelter in a nearby house which is the place from Vince’s dream. The pieces all fit together and it seems like Vince did commit murder. Why doesn’t he remember? Vince better think of something soon or he may be put in the chair. As soon as Vince wakes up with the physical evidence you know that the dream was certainly true. The real mystery is just why he did it. Does Vince have a split personality or was he being manipulated? We find out the answer near the very end of the film, but it really makes Vince look worse and worse. If a strange guy busts into your room at night and starts talking nonsense about you being tired would you just roll back to sleep? That’s what Vince does as locking a door is a foreign concept to him. Then he also displays low will power as someone offers him a mysterious cough drop thing. He declines several times, but then breaks down and haves it. Clearly Vince isn’t all that smart or determined. It’s just hard to take him seriously. At first I thought he had potential because upon appearing I immediately took note at his striking resemblance to Matt Damon. The guy looks just like him which was crazy. It’s sort of how Lon Chaney looks just like Bill Murray. Unfortunately he didn’t get any of the signature toughness that Matt usually has. He freaks out quite a lot and isn’t any good at acting innocent. When they get to the house he keeps on knowing things that he shouldn’t. Doesn’t Vince have the common sense not to make himself look so incredibly guilty? Probably not because he makes every mistake in the book. Even near the end he decides to try taking a shortcut by jumping out the window. He had been told numerous times that one of the ladies was having a kid so this was a bad time for stress and he was about to jump out while she was right there. Definitely selfish as well as being a terrible mistake. Vince singlehandily weakens the film. Fortunately Cliff is a much more reasonable character. He really hopes that Vince is talking nonsense, but it is his duty to investigate so the more Vince goes over the edge the more he has to take this seriously. I can see why he’s pretty irritable about the whole thing. He does go off on Vince during one moment, but Vince had been acting so shifty earlier. I also liked the deputy who shows up at one point to aid Cliff. The cops are all on point here which is always nice to see. 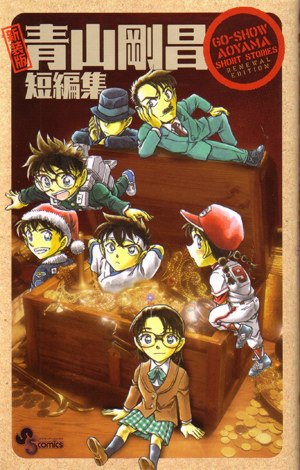 They may not have cracked the case, but it was a pretty tough one especially if you didn’t really have context for it. Now, did the film do a good job with how it wrapped things up? I think it’s a bit iffy honestly. A lot of things had to happen conveniently for the villain’s plan to succeed. The first major point is that the main character had to be terribly weak for this to work in the first place. Also, Vince couldn’t even do that right as he would have lost if not for one of the victims giving him a weapon by mistake. Definitely a very sloppy move on her part as she should have just stabbed him directly. Still, this twist at the end did add a bit of a supernatural element to the film since I never bought into this particular technique. Every time I’ve seen it used in person it was complete hooey. Maybe it can work, but not this quickly and not with this particular method. The film can be quite dramatic, but at the end of the day it’s still pretty interesting from cover to cover. You just have to get past the fact that Vince can’t seem to do anything right. Beyond that the rest of the characters are good and the writing is certainly on point. Even minor characters like the bank owner look pretty good here as they all scramble to do their jobs correctly. When Vince wasn’t home, I definitely agree with the manager checking his books just in case. Don’t want anyone running off with the money right? 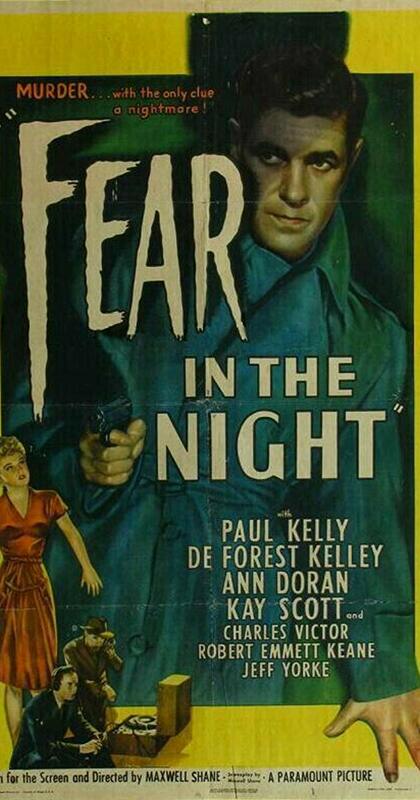 Fear in the Night plays the noir genre pretty straight. There aren’t a lot of twists and wrinkles, but there isn’t really anything bad about the film either. It’s just pretty low key. Overall, I’d recommend checking out Fear in the Night. It’s a solid movie that you will enjoy so long as you like mysteries or old school thrillers. There isn’t any real action so the whole thing is built up using pure suspense. It’s definitely not the kind of film you could really expect to see nowadays. It’s a relic of the past, but one that has definitely aged well. How much you’ll enjoy it will likely depend on how many other noir titles you’ve seen over the years. If you haven’t seen a whole lot then you’ll really enjoy it. If you have seen a bunch then this one may feel a little more generic. Still, on the whole I don’t think you’ll regret watching it. Just remember that if a stranger shows up and starts acting shifty you should show him the door. That or just don’t be weak. It’s time for a retro film with one of those names that will give you a lot of preconceived notions before the movie even starts. 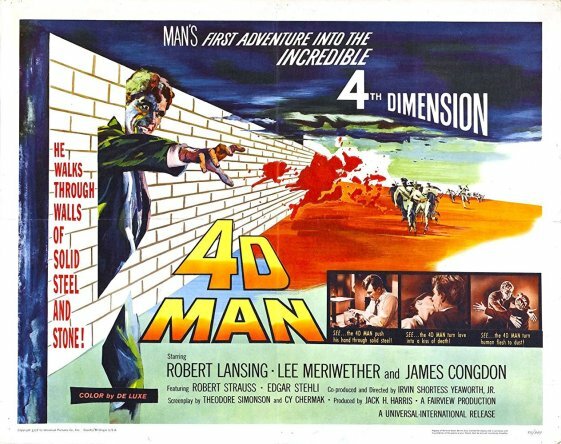 4D Man is just a total B film name and you immediately expect a campy type of adventure. You wouldn’t really be wrong either. The film isn’t inherently campy or cheesy, but it does have a pretty crazy plot and the main villain turns evil for pretty much no reason. It’s fairly entertaining all things considered but it never does anything all that extraordinary. It’s certainly worth more of a watch than the average film of this type though. The film starts with Tony blowing up his lab again. He does mean to do this all the time, but the experiment he is running is highly dangerous and he has yet to perfect it. This leads to a lot of bad results for him. As a result he is let go so he heads over to his brother Scott for some help. Scott offers him a job there, but Tony doesn’t want any handouts. Plus, Tony is irresistible and knows that if he sticks around then Scott’s girlfriend Linda will soon be his. It’s almost presumptuous of him, but he turns out to be correct and decides to stick around to be with Linda. Scott finds out and while he acts like he doesn’t care, he does deep down. He steals Tony’s research and completes it, turning him into the 4D Man. He can now go through things, but it costs him a lot of life points. The only way to replenish them is to murder someone by stealing their life force. Scott decides to do this and now Tony may be the only one who can stop him. Parts of the plot can be a bit annoying though. Nothing goes right for Scott. First off, he’s being completely taken advantage of by his boss and then his girlfriend starts going with his brother instead. Scott isn’t very good at dealing with people either so he isn’t able to try to talk his way out of it. As a result, becoming a super villain was the only path that he thought he could take. It’s all pretty tragic even if Scott does go off the deep end almost right away though. After he absorbs the energy of 1-2 people by mistake he seems to start enjoying it. If he wasn’t shot at the end he likely would have kept going. Definitely a very sudden character shift if you ask me. The film pretty much plays it by the numbers as it goes on. The writing is solid and the premise was interesting to it manages to coast by. Having one character work on a material that is unbreakable while the other tries to get matter to go through things is interesting. I don’t think we needed to add in the other jealous co-worker though. His plot ultimately doesn’t really have time to go anywhere and feels like a dead end by the time the film ends. Maybe he was just there to give a reason as to why the boss would have Tony’s idea with him which adds to the climax. Still, it would have been easy to have the scene anyway since Scott had a bone to pick with him from the start. I don’t think the cops handled the climax well though. Sure, they surrounded Scott, but they knew about his powers so why would the guy get so close to him? Scott’s abilities are pretty dangerous, but against a group they aren’t as potent since he needs to become tangible at some point to grab them. Instead the cops get completely outmaneuvered and it costs them dearly. Even at the end everyone runs off so Linda has to deal with the threat on her own. She handles herself well but I’d probably ditch Tony after that. Overall, 4D Man was a decently fun film. Parts of the story do feel a little forced though like Tony agreeing to cheat with Linda on Scott or Scott turning evil. I dunno, he just didn’t seem quite crazy enough to go full psycho compared to most of the other characters. The film does hint that the actual radiation and such affected his mind a bit though. That or his mind being different from the start which triggered the transformation is to blame. Either way, I think the film could have played him up more as an anti hero than turning full mass murderer by the end. Still, I’d recommend checking this film out if you want to look at a retro thriller film. It’s like watching a villain about Shadowcat but if she was the villain. Intangibility is a simple power, but a very deadly one nonetheless. It’s time to look at an old school thriller film as the heroes try to find a mass murderer. The premise of having a lady sign up to be an officer and try to use her wiles to get to the villain is always a pretty iffy one. Fortunately this film manages to handle itself with a bit more care than most as she is being bait without having to go too far. It’s a pretty good film and the police actually look very competent this time around. The movie starts off with Sandra making ends meet at a dance club. It’s a pretty tough job, but it pays the bills. She is then scouted by a talent manager for a more high end location. Before Sandra can properly go and interview one of her friends becomes the latest in a string of victims from a mass murderer. The only clue is tat he always sends a poem to the cops and he has been getting his victims by putting ads in the paper. The cops head to Sandra and enlist her help. She’s certainly eager to help apprehend this villain and agrees, but this task may prove to be even more dangerous than she had expected. After all, Sandra ends up finding herself wrapped in not one, not two, but three different villainous plots. It seems like this is a pretty shady town as you have kidnappers and psychos running around who aren’t even related to the main murderer. They do make for good red herrings though. Fortunately Sandra is definitely a tough character so none of this scares her out of the game. She takes it all in stride and keeps on going. Sandra is one of those characters who will use a lot of wit to cover her emotions which works pretty effectively. I’m glad she’s not nearly as easy to get as many other heroines and ends up being one of the stronger characters here. I think the only time she slipped up a bit was in trying to hide the evidence from Fleming as confronting it directly might have helped speed up the climax a bit. I mentioned earlier how the police actually look pretty good here and that is thanks in no small part to Harley and Barrett. Harley is the police chief and he continues to try and solve the case from the start to the end of the film. He comes pretty close to solving it quite a few times even if he ultimately fell short. Then we have Barrett who is Sandra’s bodyguard and usually manages to keep himself close enough to help. A lot of times the bodyguard just ends up vanishing so I’m glad that wasn’t the case here. He was a bit slow to the park so it’s not like he’s infallible or anything, but he definitely tries. If the police are going to use you as bait they had better have someone at the ready. Whenever they are supposed to be guarding the character and the villain gets to the witness anyway it can definitely be pretty iffy. Then we have Fleming. He’s a rich guy who likes a good challenge and solid music. He does tend to flirt a lot though so he is another one of those characters where you can’t really trust his sincerity. As a result that does hurt the romance between him and Sandra. You just don’t think it’ll ultimately last so with them rushing so much towards marriage it seems like they will likely regret it at some point in the future. At least he can fight though, Fleming gets into a scuffle and comes out on top. He also does have a decent sense of humor like pretending to be the secretary for a while. As he said, Sandra started it so he may as well continue to play the game. As is typical of these classic films the writing is also on point. Pretty much all of the characters are very tactical and always planning out their next move. The script has a lot of witty dialogue and solid moments for all of the characters. It’s also always nice to see the heroes and villains beating around the bush the whole time as they passively accuse each other. Makes for a fun dynamic. The film is a bit long and does tend to drag on towards the end, but still ends up being an enjoyable adventure. 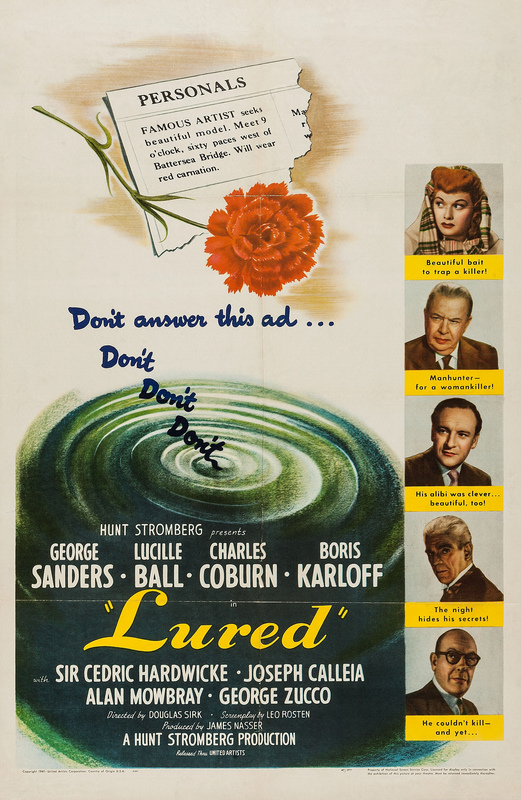 Overall, Lured is a pretty good film. It’s a fun noir title that is well constructed. The police actually have a solid plan right from the start and while Sandra has to do a lot of work to make it succeed, they aren’t just callously throwing her away like in other operations. They are still all about protecting the people and agent or not, Sandra is one of them. They get the whole team on the case and there’s just a lot of good teamwork here. You’ll probably figure out the mystery before long, but there are enough suspects where the film doesn’t make it too easy for you either. You’ll have to at least connect a few dots in order to get to the right place. The romance is a bit weak, but if that’s the most negative thing I can say about the film then you know it’s still a winner. I’d recommend checking it out. It’s time to look at a murder thriller from a little while back. The concept of Double Jeopardy is definitely an interesting one. I get the feeling that there is a little more to it than what the film would have you believe, but it certainly works for the premise. Of course, that’s part of the problem. The film keeps building up to this but we ultimately don’t really get to see it in action. I was expecting the heroine to use it to her advantage but in the end it feels like more of a red herring/missed opportunity. The film starts with Libby and her husband Nick finally getting ready to take the voyage they had been planning for a while. Unfortunately after Libby goes to bed she wakes up to find that he is seemingly dead. (No body tho) The cops arrest her and blame her for the murder. There’s way too much evidence for this to be an accident and that’s when Libby finds out that Nick faked his death so he could go live with her best friend. Libby’s kid is also with them naturally so she swears revenge against him. Another inmate lets her know that because of double jeopardy she can go destroy Nick now since she already did so once and can’t be tried again. After 6 years Libby is out of prison and ready to begin the hunt. Unfortunately, officer Travis is on her tail so Libby’s really gonna need to hurry here. Naturally it’s tough to track someone down when you haven’t seen them in years and there’s no handy Google to check things out. Fortunately Libby is pretty good at social engineering and quickly begins to break the human element that always fails the various computer systems and works her way to Nick. She’s definitely very determined in that goal and makes for a fun lead. Libby’s tough and to the point, definitely well ahead of her time as far as protagonists go. She does get a bit iffy towards the end though which is where the writing drops the ball. So at one point she finally finds Nick. At this point there is no reason why Libby shouldn’t just shoot him. Keep in mind that she’s not a super hero or anything like that. Libby’s here for her kid and could care less about the rest. The justice system failed her so she wants to make things right. By that logic shooting Nick is the quickest way to end things. She can easily prove that he was her old husband after that through photos and then she would get her kid. I suspect that her kid is the only excuse as to why she wouldn’t do that, but logically it would all work out. Just take Nick down and you’re good. Instead she falls for one of the most obvious tricks in cinema and then gets tricked a second time in the climax. It was hard to watch this because she had been looking so good for quite a while to slip up like that. It’s a shame, but I guess the character couldn’t be perfect. She’s far and away the best character in the film despite this though as you can only be so hard on her for making these mistakes. Then you have Travis who certainly isn’t having a fun time. He gets beat up by his own captive and then is playing catch up for the rest of the film. He’s a bit slow on the uptake but ultimately does try to look into the situation so I’ll give him some credit there. He is a fun character and while the characters give him a hard time for not giving someone a second chance, he made it crystal clear from the start that they were already on their last shot. Miss the curfew and it’s back to prison for you. He’s also pretty sloppy towards the end of the film though. I guess maybe the lighting messed with them all or he popped off too soon thinking the case was over. Finally you’ve got the main villain Nick. He’s pretty much your average rich villain. The guy switched identities twice which is impressive enough and goes farther than you’d expect. Still, nothing much to like about his character. He just wanted to escape the taxes and all of his excuses are pretty fake. I do also have to wonder how he was able to escape so smoothly in both cases. I get that everything was more lax back in the day, but in all 3 identities he kept the same exact job and status. Didn’t anyone in those fancy art circles recognize him? You’d think that they would. Before Nick’s death the film tries to sell you on what a good guy he is, but you’d likely know the premise of the film so it doesn’t work. Even if you don’t, the film lays the seeds of doubt early on as he jokes with the friend that Libby won’t like the truth when she finds out. There’s a lot of dialogue between the words hinting at his cheating the whole time. As such, we could have cut down on the romance scenes early on as they don’t add to anything. If the film was determined to try and show us that Nick was a good guy for a while, maybe show scenes with people in the neighborhood saying what a great guy he was. Otherwise he just seems like a corrupt rich guy from the start. 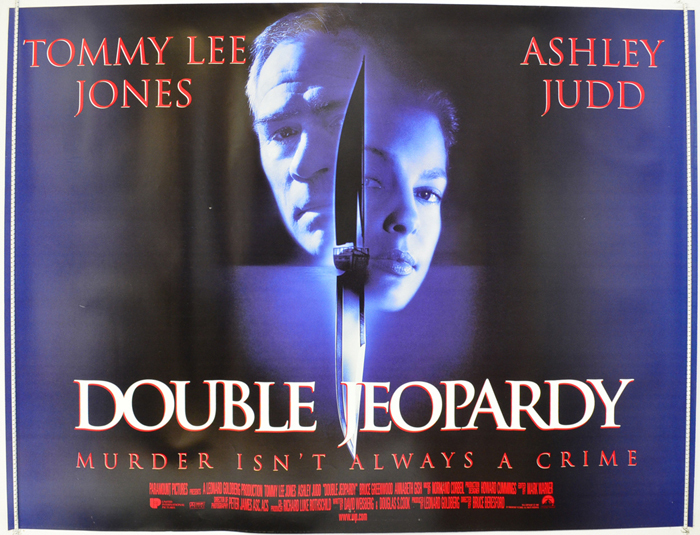 Overall, Double Jeopardy is a pretty decent thriller, but really missed the whole point of its title by not actually utilizing Double Jeopardy intentionally by the main heroine. She should have shot him in the middle of the big parade to prove the point or something like that. Instead the law never really gets taken into effect as the ending can still be considered self defense. Still, that aside it’s solid. The opening is a bit slow but things pick up once she’s on the hunt. The story of the lone vigilante is always an enticing one and this film handles it well. If you haven’t seen this film yet then I recommend checking it out once it’s on TV again. Once she’s in jail the film really starts. It’s time to look at what I would have considered as a fairly obscure film but that doesn’t appear to be the case. I can certainly admit that I had never heard of M prior to watching it. It’s one of those films with a really dark premise where the less you see the better. The film’s main purpose is about the aftermath of the event after all. I’d say that the movie handles itself with class, but really drops the ball at the end. Drop might not be the right word, more like the film spiked it when they were nearing the goal. The ending practically writes itself. There are many ways that the film could have gone, but the ending we got was probably the most unsatisfying option of the bunch. The film starts out with another child going missing. Unfortunately kids have been murdered all across the city and the number continues to grow. The public then receives a letter that the murderer isn’t done yet and intends to continue his streak of carnage. The citizens are growing uneasy with the knowledge that the cops have uncovered no leads and are starting to take the matter into their own hands. They’ll find the murderer even if they have to assault a lot of normal joes in the process. The cops also ramp up their efforts as a lot of heat is being directed at them. This leads the underworld to do their own investigating since the cops are going to be a nuisance until this is all cleared up. With everyone on the lookout for this elusive murderer can he possibly evade them all? The film changes viewpoints quite often as we see what all 3 parties are thinking and how they plan on handling this. The cops certainly mean well, but naturally they are limited in what they can do during this case. They could use undercover cops but there are only so many of those. The cops in uniform won’t find anything since people can spot them a mile away. The criminal also has the advantage of being able to wait them out and attack when he feels like it. As such the stress on him is far less than that of the cops. I think the film did a good job of giving the cops credit as they do try their best. The situation simply was not in their favor, but it’s hard to say what they could be doing better. Meanwhile the Underworld starts obtaining clues and such with almost comic ease compared to the cops. As soon as they decide to catch this guy we enter the climax of the film. Some parts can still be a bit of a stretch though like with how the murderer is somehow able to evade all of the guys they had after him. Even cornering him in the building takes forever. Still, they ultimately did get their man and then they bring him over to a court room of their own creation to be judged by fellow criminals. This is the only part of the film that starts to drag a bit. We have the villains grill him a bit and explain to the villain that he’s basically doomed. Even his defense counsel thinks he is doomed. Now we get into the spoilers territory so this is your chance to back off now while you still can. Are you ready? Well, then the film goes sideways when the villain makes a long speech about how he’s insane and can’t fight his murderous urges. He wants them to take pity on him. The villains do not except for his defense counsel who suddenly takes his role seriously and starts yelling at everybody. We get a long back and forth at this point where he tries to seriously make the case that since the villain is insane he should be taken to an institution instead of paying for his crimes. The leader of the gang had just gone through this “plea” with how rigged it is and how the villain would simply be back on the streets again. Isn’t it convenient that this villain would make the same case after that? Then the court is interrupted by the cops showing up and arresting everyone. The villain is put before another trial and then the film ends. You are left to wonder if the gang is right and the villain will get off on a plea of insanity or if he will have to pay his dues. I’m inclined to believe that it would be the latter but I think this wasn’t the right time for such an open ended final scene. It also makes a lot of the other scenes feel pretty much pointless. It’s why you have a sense of unease during the villain court scenes as you just get the feeling that something is going to happen to interrupt it. Call it a hunch, but the characters were not going to destroy the villains. That’s fine enough, but I’d like some assurance that he will at least go to jail. Also, while realistic it can be annoying to see all of the gangsters suddenly arrested while the cops prepare to take all the credit. They didn’t do much here while the gangsters did all of the work. The gang members were crooks through and through so they can’t blame anyone but themselves but it’s ironic that the only time they are caught is when they try to help the cops restore order to the city. Their motives may not have been pure, but they got the job done. Again, after everything that happened throughout the film and how hard it was to catch the villain this just wasn’t a very satisfying ending. 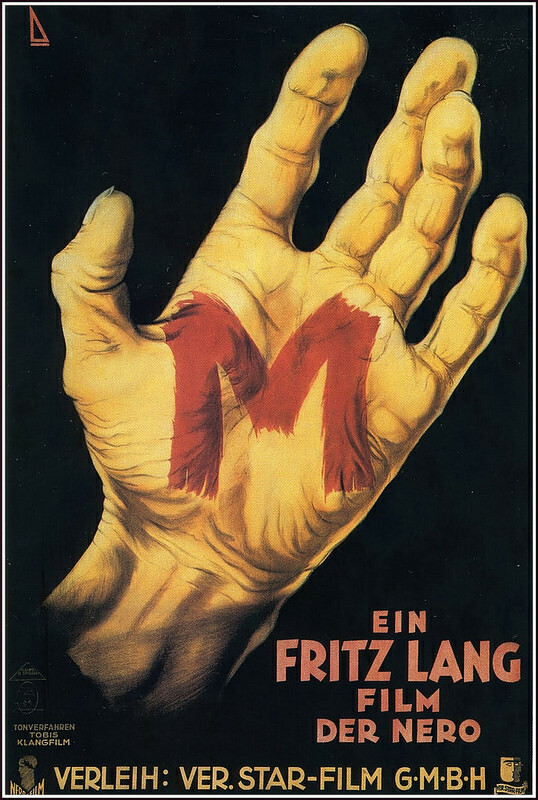 Overall, M is definitely an interesting film. I believe it’s the only German dubbed film that I have seen so far. As I mentioned this film is pretty dark so don’t expect too many laughs out of it. Still, the film does try to inject some humor in from time to time to keep the film from being too broody. How well it works will depend on how into the plot you are. I’d say that the writing is sound and the film certainly could have been a lot worse given the premise. It’s not one that I’d recommend a film try to adapt but considering that it did I think this movie did a pretty reasonable job. I wouldn’t recommend it to everyone but if you want to see a scenario where villains and heroes alike go after one guy this is definitely the film for you. It’s time to look at a really old noir film. This one deals with the court system which is always fun and the heroes have to wonder if the Jury is really paying attention. After being on the jury I can say that this film was actually super realistic both in how the jury absolutely doesn’t care in with the judge who has already made up his mind. The film is a pretty solid thriller throughout and while a certain character can be rather annoying, it’s a fun package overall. The movie starts off with Mike finally getting his big break. He noticed someone talking tough about murdering another guy and shortly afterwards we find out that the person was stabbed. The suspect is taken into court and thanks to Mike’s testimony he is taken to prison to await the chair. Mike’s friend Jane isn’t thrilled about all of this and decides to guilt trip Mike. She basically says that he should have just pretended not to notice and then the guy would have been caught. She believes that he is innocent and this gives Mike nightmares. A similar situation occurs in his house and now the cops think he is the murderer of a different case. How will he get out of this one? In case you didn’t guess, the character I didn’t like here was definitely Jane. I definitely don’t think she was in the right with guilt tripping Mike so much. Once he was on the stand he was obligated to tell the truth after all. If her issue was that he let the cops know in the first place she should have specified that a little more. Even so that would be morally dubious as well.Maybe it was the fact that Mike seemed to take a little joy in all of this for his promotion. Either way she just didn’t handle the situation well and then showing up in court only to make a scene and run off didn’t help either. She shouldn’t have gone if she was going to be that excitable. She just didn’t really contribute much until the very end. At that point her plan also could have sued some serious work as she needed to call the cops right away or force herself into the house. Walking around with a murderer just usually isn’t going to end well. She also looked bad in the dream, but I guess I won’t count that since it wasn’t technically her. Mike is a reasonable main character even if he tends to overthink things quite a bit by the end. Especially after the whole gloves thing he probably shouldn’t have just grabbed the door so casually. Beginning to pack was also sketchy since he knows that it didn’t really help the other guy’s case all that much. Phoning it in to the cops was definitely the right move at least even if it came close to backfiring. Mike just didn’t really think these things through. He was a fun character for the first half, but he just wasn’t very smart and got maybe too distracted by romance as well. Then we see his flashbacks where he constantly flies off the handle and is tempted to murder someone multiple times so I think the guy was just unhinged. It would explain his dream sequence as well. The dream was quite good though. Also, while I wasn’t a big fan of the main duo, this was still a very solid film. The writing is on point and the court scenes are fun. It’s a quality thriller that builds up the tension and doesn’t go for any crazy shock value. That’s the kind of film that you want in your corner. The pacing is on point and even though it seems to be made on a fairly small budget you never feel confined to any one backdrop. The core characters have enough personality to keep you entertained. I was getting mixed signals from Jane the whole time though. The scene inside Mike’s apartment was just odd as she kept moving away from Mike and denying him the whole time. She would do that, but didn’t actually leave and came across as half flirting. I thought the film was going to have her admit that she didn’t actually like him, but the movie never goes there. It just feels like a random plot point. This film made sure to make the neighbor rather unlikable, but he wasn’t too terrible I’d say. The guy was rather annoying, but not completely unreasonable in some areas. If the rule really is not to have any guests over then he’s not technically wrong. The type writer part is tricky but it did seem rather loud so maybe Mike could have done something to be quieter. I don’t think he was ever intended to be a sympathetic character though. The dream sequence is rather long, but certainly well done. It’s a nice look at what could have happened and the whole situation almost came to pass. I have no doubt that Jane would take the stand against Mike and the Jury probably wouldn’t believe his story. Especially since Mike was intent on mentioning his dreams and pre-cog abilities. Since he is a reporter you’d think that Mike would realize how crazy that all sounded. Again, he wasn’t the sharpest tool in the shed. As for the actual villain in this film, I can’t say that he was very smart. He was constantly tempting fate by staying near the scene of the crime. It’s hard to even say what his goal was here. I assume he is murdering people to get some money and he doesn’t want to go back to prison, but once he has the money what is he doing with it? You’d think that he would have skipped town or something. He also doesn’t even have a home despite robbing 2 people successfully. I think this guy wasn’t very good at budgeting. 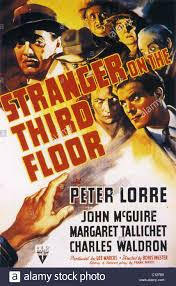 Overall, The Stranger on the Third Floor was pretty interesting. The title is almost a little odd though as the stranger doesn’t show up for a very long time in the film and technically doesn’t even appear all that much. I guess it will help you stay alert for when he pops up though. If you haven’t seen a quality Noir film yet then this is the way to go. It’s basically the complete package so you can’t go wrong here. It’s time to look at an old school film that shows how one dangerous decision can put you on the path to ruin. I’ll give the credit for not making the main character be an obvious cheat who you can’t sympathize with as he stays classy for the most part. I would still argue that he knew how his decision was pretty iffy though by how many times he mentions that he really shouldn’t be here. At the very least he doesn’t actually do anything serious. It’s a fun movie overall even if you aren’t rooting for the lead. The film starts off with Richard making small talk with two of his buddies. Richard is sad that he can’t be reckless anymore since he has gotten to be too old. His friends point out that this is true so Richard better not get any ideas. That’s when Richard notices a lady behind a portrait and she invites him to her place for drinks. It’s nearly midnight but Richard doesn’t care so they head upstairs. That’s when a guy runs in and attacks Richard. Richard quickly murders him and hides the body in a forest, but can he stay out of the papers? After all, his friend is a detective so this can get very messy. While the film is played straight for the most part, I do think it had a little fun with Richard’s character during the early part. Richard is so oblivious to life that he keeps on tipping off the cops on how guilty he is. When the detective finds out that the culprit has a cut on his palm Richard quickly points out that he has an identical cut. I suppose being over the top like this could throw the cops off the trail…but it’s just such an unnecessary risk. Realistically nobody suspects him at all at this point so why put himself out there. There is literally nothing to trace him to the murder as far as he knows. Then he continually says things that he shouldn’t know and even walks over to the spot where the corpse was before the cops officially show him. He makes a ton of rookie mistakes. The film did say early on that he is usually scatterbrained but this is taking that to a bit of an extreme. He also leaves his pen at the scene of the crime which the villain naturally gets his hands on. So, there was a bodyguard assigned to the victim and now he has decided to blackmail Richard and Alice. This is definitely the weakest aspect of the film as it wasn’t really needed and I would have preferred the tension to be that the cops are slowly zeroing in on the heroes. Instead this guy works well as the fall guy I guess, but naturally the plot turns into Alice having to use her charms to get him to lower his guard. That’s still one of the most tired film cliches out there and it makes the plot pretty bad. Still, the film doesn’t go too far with it which is good so it doesn’t hurt the movie all that much. At most it takes 1 star off. I’m also glad that Richard realized that paying the guy off wouldn’t solve anything since he would just return for another installment at some point. Calling his bluff would be best, but the guy would probably just end up murdering them. Initially I figured that Alice intentionally set up the meeting with Richard and the other guy to bump him off, but the film never really goes in that angle. As far as I can tell it was just coincidence and the film doesn’t make Alice appear to be malicious. I do like the fact that she is also fairly smart though as she gets some extra insurance from Richard in case he ends up ditching her. That’s definitely the kind of thing you want to do in these films because you can’t trust anyone. She handled the situation much better than Richard in general as she got all of the hard jobs and didn’t panic the way that he did. As I mentioned I wasn’t a big fan of Richard. He was a much better character than he could have been, but at the same time you still were never going to root for the guy. He also decided to take the easy way out at the end which is definitely never the right call. The ending can be seen as a bit of a cop out but you can also look at it in a more meta sense. It’s pretty clear that the film was not supposed to end the way that it did and since the movie is an indie you always look for the hidden meanings. You could make the case that the ending is actually the dream as he passes over to the next plain. It’s like the film has its direct ending and then the layered one that you can add on. Either way it doesn’t look good for the lead. I do appreciate that the ending gave the film a quick humor moment that actually worked though. In general I thought the film had a good balance of humor and mystery. What the film could have improved on to be even better would have been to focus on the detective plot more. The scenes with the detective were some of the best in the film. I liked how Richard kept giving himself away and the detective would act as if he started to suspect something. His boss was also pretty solid in that regard with the constant banter. Seeing more of them would have been a lot of fun and that could have ended up being the main plot instead of the black mail guy. There will always be a lot of “Could have” moments in a film of course, but this would have been a pretty easy alteration with a good result. Maybe even throw in a court scene since those are always awesome. 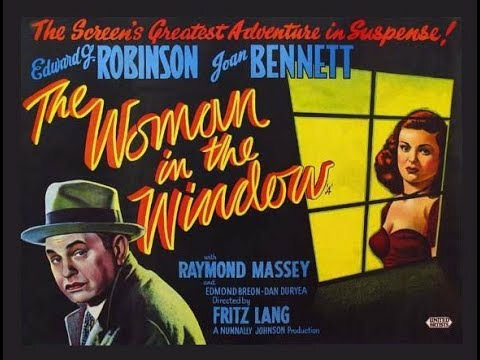 Overall, The Woman in the Window was a solid film. The writing is on point and the cast is pretty good. The film is never too exaggerated and stays realistic without being dreary. You’re able to root for the cops without necessarily rooting against Richard because you can at least make the case that he was never going to cheat and he certainly didn’t expect things to go sideways the way that they did. I’d also say that he had to defend himself the way that he did because he definitely wouldn’t have lived through the night otherwise. As the film explains in the beginning, self defense is certainly way different from murder. This would definitely be the former. If you haven’t seen a good noir film yet then this is the one to watch. It’s not the best one out there or anything, but it’ll give you a good idea of what the genre is all about and holds up well for itself. It’s time to look at the next Holmes mystery. 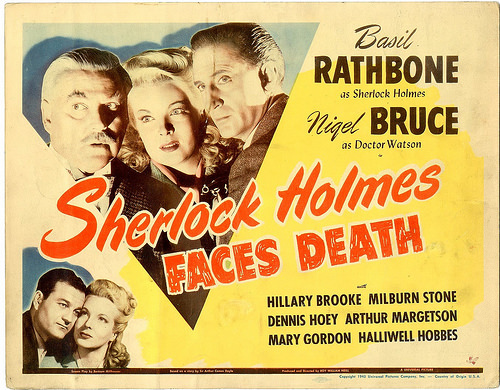 This one goes back to the more classic days of Holmes as there is a murder and various suspects. He has to find out which one is guilty after talking to them all and evaluating the evidence. The case is extra personal though as it occurred within Watson’s own professional workplace. Watson gets some extra background in this film. He is always referred to as a doctor but we never actually get to see him at work. Here we find out that he has taken in quite a few patients who need some slight help. They are all rather eccentric but supposedly harmless. Their current home is that of a fairly wealthy jewel evaluator who doesn’t get along with anybody. He definitely likes to be the leader of the household. Well, he is murdered and since nobody liked the guy that doesn’t help Holmes narrow the list of subjects. First we have the man’s younger brother. This guy seemed content to follow his senior’s orders and thought whatever he was told to think. This didn’t stop him from eavesdropping though and curious enough he also had a tendency to crack his knuckles when asking questions. That could be seen as a threat. Then we have the Butler and the Maid. The Butler is always eavesdropping and as such he knows a little bit about everyone. He also likes to get very drunk and maybe this is just to throw Holmes off the case. Who can say for sure eh? The maid seems less suspicious at first glance but she keeps trying to convince the Butler not to say anything to Holmes. Does he know something that he shouldn’t? We can’t forget the other two guests either. One is an old guest from out of town who threatens to beat up the latest member of the deceased. On the other hand, the cops grab him as the one they picked as the culprit so that gives him a huge chance of being innocent. There is also the heroine who is with him but her role isn’t all that large once he leaves the picture. With a colorful cast of suspects it looks as though we have quite the mystery on our hands. As always Holmes is the best character here. He learns of the mystery and quickly gets to work on solving it. He wastes absolutely no time here and that’s what makes him so good at his job. He isn’t here to make friends so he is able to walk into any house with a lot of confidence and look for the clues. This time his plan actually involves having a fight with the main villain and pulling a gun on him. Holmes doesn’t get to fight very often but when he does it is always fun. He does seem to be quite proficient in hand to hand to the point where he is able to alter the battle to whatever direction he wants. Then we have Watson who is back to his old self. He isn’t quite at Holmes level but he is earnest and always has a lot of confidence himself. Despite Holmes constantly hitting him with subtle insults Watson never lets it get him down. As this mystery takes place in his place of work he actually can move around like he owns the place. Although, Watson typically does anyway. He’s definitely a very good character and the films wouldn’t be the same without him. We can’t forget the Police Chief Lestrade either. His rivalry with Watson continues as neither one of them cares much for the other. I do feel bad for the Chief since he always tries deductions of his own but they never seem to go very well. He just has no luck in finding the secret mystery that is underneath the obvious one. At least you can’t say that he doesn’t try hard though as Lestrade even heads into a dark tunnel on his own to catch the culprit. As always the writing is on point. One of the strengths of this Holmes film series is that the dialogue is always fast and snappy. This is part of what has helped this Holmes become the definitive one. He just embodies the character so completely and faithfully. Every character does their best to contribute as well though. Then the humor is on point as well which usually comes in the form of some sarcasm. I find that this is consistently the best kind of humor. 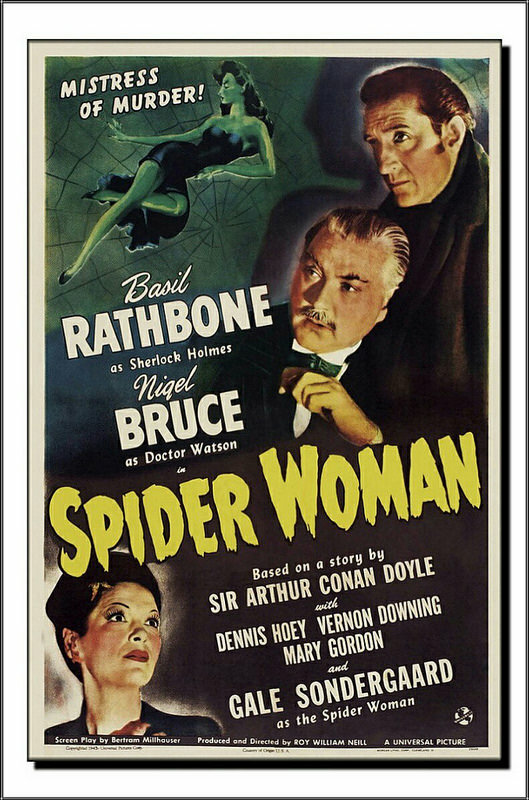 Overall, This Sherlock Holmes film was pretty fun. It brought the series back to its roots and it will be nice if this style has been brought back for good. The thrillers are fun as well of course but the series certainly made its mark on the world through its mysteries. If you haven’t seen a Holmes film yet then this is as good a jumping on point as any. So far you never really need knowledge on previous films to get the gist of what’s happening. They do a good job of explaining the plot right away.